Here in New York, Manhattan and Brooklyn, it’s so easy to let your closets and homes get out of control, as living in the city means small spaces and not enough time to organize them. Luckily, the New York California Closets team put together ways to help you clean up your closet for good, and it starts with a closet system. A closet system is a functional closet that utilizes every square inch to incorporate closet accessories to organize all of your items – whether in the bedroom closet or the garage. In smaller spaces in big cities, it’s important to rely on those closet accessories to do the organizing for you. Shoe Storage – Beautifully display and store shoes in a fence, cubby system or glass showcase. Drawer & Shelf Dividers – Keep your t-shirts separate from your socks with easy dividers. Jewelry Drawer Dividers – Beautifully store and display your jewels and heirlooms with a gorgeous display. Hooks, Poles and Pullout Accessories – Use every square inch to hang and assort your clothing. Hampers & Baskets – Keep dirty clothes concealed with a pullout hamper or basket system. A slat wall system in a garage or closet to hang everything from bikes to rakes to ties and hair accessories. Adjustable shelving in a kid’s closet to ensure adaptability as your child grows from toddler to teen. Vertical shelf dividers in a custom laundry room that allows you to easily store mops, brooms, and other cleaning supplies. Note: Make sure to utilize corners, walls and unexpected places to keep items off of the floor and out of the way. 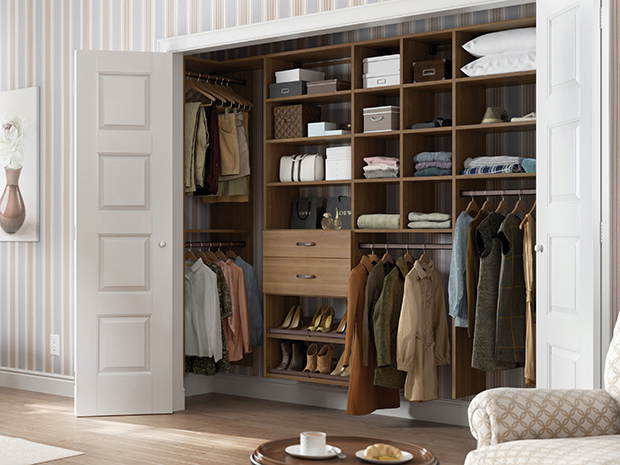 If you’re ready to get your closet’s organization under control, contact the California Closets New York team. You’ll receive a complimentary in-home expert design consultation or you can visit our showrooms on the Upper East Side or Tribeca. Featured on Houzz, California Closets has been building beautiful closets, garages, mudrooms and more for homes across the country for nearly four decades.